Intention by heart to perform the prayer which he wants to fulfil, either an obligatory (fard) prayer or a supererogatory prayer. In all cases, one should not pronounce his intention openly, because neither the Prophet nor his companions used to utter the intention for prayer. Thus, pronouncing the intention for prayer in an audible voice is a heresy and an illicit action, whether the individual be an Imam or not. -- Intention by heart to perform the prayer which he wants to fulfil, either an obligatory (fard) prayer or a supererogatory prayer. To pronounce “Takbirat Al Ihram” that is to say “Allahu Akbar,” celebrating by the greatness of Allah (subhanahu wa ta’ala). 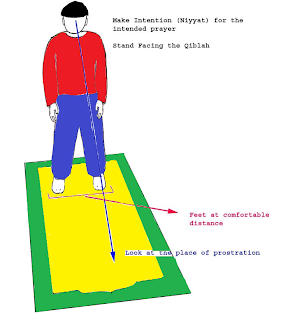 Meanwhile looking downwards to the place where you will prostrate. To put one’s right hand over his left hand and left wrist, and put them both over his chest. III. Or any other supplications which the Prophet (salaAllahu alayhi wa salam) used to say in his prayers. 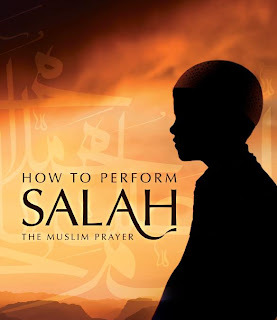 It is better to recite these supplications alternately, the first one in the morning prayer “Fajr ,” the second in the noon prayer “Zuhr,” each one by turn, in conformity with what the Prophet (salaAllahu alayhi wa salam) used to do. Then surah Fatiha (The opening Surah of the glorious Quran) is recited. The worshipper should say “A’meen” after reciting the Fatiha loudly if the prayer is said loudly and whisper it in inaudible prayers. -- Zuhr (noon), Asr (late afternoon), and Isha (night) prayers à verses from medium sized surahs of the Quran. -- Fajr (morning) prayer à a passage from the long surahs of the Quran. -- Maghrib (evening prayer) à one has the choice either to recite passages from the long surahs or from the short surahs of the Quran. 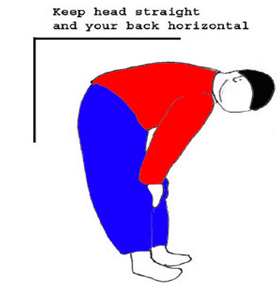 Then one must bend down, making his head and back on one level and putting his hands, with the fingers spread, on his knees. ahl ith-thanai wal-majd, ahaqqu ma qalal-‘abd, wa Kulluna laka ‘abd, Allahuma la mani’a lima a’atyat, wala mu’atia lima mana’at, wala yanfa’u dhal-jaddi minka al-jadd. 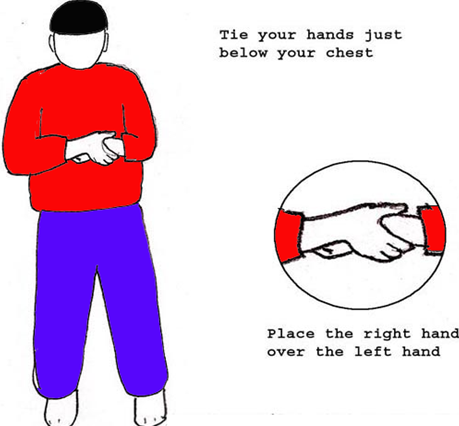 The worshipper is advised to put his hands on his chest, as he had done before he bowed. -- Both Wa’il Ibn Haggar and Sahli Ibn Sa’'yd reported that this was the manner of the Prophet when he used to raise his head up after bowing. Jazak Allah khair for this much needed and beautiful article.